In August of 2016, we announced some changes in the Project Online plans that will be available to you, as some plans expired at the end of 2016 and new ones became available. Many of you may now need to renew your retired Project Online plans and move your users to the new available plans. The 64-bit version of the Microsoft Online Services Sign-in Assistant for IT Professionals RTW. The 64-bit version of the Windows Azure Active Directory Module for Windows PowerShell (64-bit version). For more information, see Connect to Office 365 PowerShell. This lets you to enter your credentials needed to connect to Office 365. As a first step, you need to know which Project Online licenses you have and which users they are assigned to. This will help you to determine which new Project Online licenses they will need. We suggest using the Manage your Office 365 Licenses script that you can download from the Microsoft Code Gallery. This script lets you create a comprehensive report of assign skus and enabled plans that prints out to a .CSV file. We can also use it for replacing your users assigned sku, which is described later in this article. Make sure to run Get-Help on the script to get more information about usage and examples. This will agree to the disclaimer, create a log file called MyReport.log and save it to the current location, and will create a License Report CSV file and save it to the default location. If you open the log file, it will contain the output displayed in the module when you run the script. 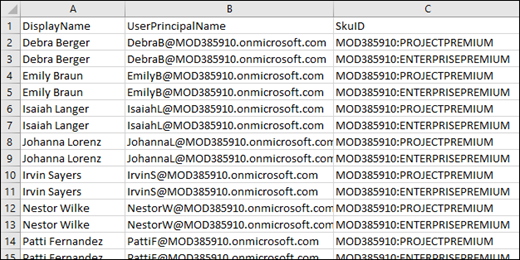 For example, in the graphic above, you can tell that each user listed has both a Project Online Premium and an Office 365 Enterprise E5 sku assigned to them. MOD385910 is the org id. You can use your column filters in Excel to easily group users that are assigned specific licenses. For example, you could find out which users are all using the Project Lite, Project Online, and Project Online with Project Pro for Office 365 Skus. The following tables lists the possible Project Online Sku strings that you will see in the script results. You can use the following table to help you determine which Project Online skus are based on the Sku strings. You will also need to know what the new Project Online sku strings mean when you need to assign them to your users later in this article. Use this article to get an overview of retired and new Project Online plans, and which plan you are likely to move to if you want the same functionality from your previous plan. Use this article to get a detailed look into what each of the new Project Online plans provides you in terms of features and functionality. Use this site to see pricing and a high-level comparison of Project cloud-based solutions. Now that you know what you need, you can now purchase the needed number of licenses you need for each new Project Online Skus. You can do this through the Office 365 Admin Center through the Billing page. You will want to Buy licenses for your Office 365 for business subscription. After purchasing the Project Online Skus that you need, you now need to assign them to your users. You can use the Manage-MSOLLicense script you ran earlier to do this, but it will require additional parameters. Your Office 365 domain name. The Sku you are assigning to the user. The Sku you are replacing. After populating the $users variable with your Office 365 users in your tenant, the script first agrees to the disclaimer, sets the log file location, and then sets the new Sku as Project Online Essentials (PROJECTESSENTIALS) for all users who have the old Project Lite Sku (PROJECT_ESSENTIALS) . This command reads all of your users who are in the HR department and who do not already have a Project Online Premium Sku (PROJECTPREMIUM) . The script then agrees to the disclaimer, sets the log file location, and then sets the new Sku as Project Online Premium for all users who have the old Project Online Plan 2 sku. As mentioned previously, run the Get-Help command to take a look at detailed usage information and additional examples. It will also provide you information about additional uses of the script that are not needed for this article. After running it, open the newly generated License Report in Excel and search for any occurrences of the old Project Online skus. Also verify that if you have any unassigned old Project Online skus, that you cancel them in the Office 365 Admin Center on the Billing page. You can search for retired skus by simply searching the file for occurrences of the retired Project Online sku strings. If you have any issues in trying to move to your new Project Online skus, you can Contact support for business products - Admin Help for assistance.